I think Easter is a perfectly lovely holiday. I was raised Methodist, and when forced to fill out a demographic form I will still default to checking "Methodist" for my religion, but our family are not regular church goers at this point in our lives. Some of my favorite church memories growing up involved Easter. Dressing up, getting new shoes, candy, kids in pastels running like mad in pursuit of ALL THE EGGS, but one of my favorite memories was flowering the Easter cross. A massive wooden cross hung at the front of our church sanctuary, all dark wood in a dark brick 1980's Methodist church. We had stained glass windows, but everything seemed dark in there until Easter. On Easter, that dark serious cross turned into a massive flower cross when a large wooden frame filled with small holes was placed over it. Then before the first service, all of the Sunday school students and teachers filled each hole with a fresh flower. The narthex smelled amazing when filled with those hundreds and hundreds of lilies, tulips, carnations and roses. Once all of the holes were filled with flowers, several of the men would lift the frame, carry it into the sanctuary, and carefully hang it over the wooden cross. It was such a joyous moment, filled with the sensory power of color and fragrance as hundreds of springtime flowers filled the sanctuary, reminding us all of why we were sitting there dressed in our Easter best, filling the pews. That's the kind of Easter I enjoy now. A celebration of spring time and renewal and time spent with loved ones. So we had our own version of that this year, plus some snow. Xavier's got the Easter bunny all figured out, so we still hid some eggs and gathered his favorite treats in a basket, but it was more mellow excitement than last year. 10 years old don't always want you to see how excited they are and a little bit of cynicism starts to sneak in. But even in the snow, he ventured out in pursuit of the eggs and had a great time, ever present Easter ring pop firmly in place. I told him that all day I could imagine what he looked like as a baby, since that ring pop looked like a pacifier shoved in his mouth. He was unamused. After the eggs were retrieved, candy consumption had dwindled, and Joe and I had consumed some massive quantities of coffee after our 5:45am wake up, we lounged around in our pjs, the weather making us less inclined to get out of the house until our family dinner plans later. So the boys watched some TV, played a little tablet, I did some drawing, talked to Grandma Becky on the phone, until we all got a little bored and Xavier asked if we could cook something fancy for lunch. Instead of fancy lunch, we decided we'd finally try out our Star Wars cookie cutters. I mixed up our go to 3 in 1 Sugar Cookie recipe, got the dough chilling in the fridge, and made my very first Royal Icing. Wow, that's so easy with a Kitchen Aid mixer. It almost felt like cheating, it took so little effort. And once the icing was all bagged up and ready, we waited for our dough to chill out and watched the classic Easter movie, The Wolverine. Ok, maybe it's not an Easter classic, but doesn't Wolverine fit in with that whole rebirth, rejuvenation theme? I kid. Once our dough was chilled, we rolled it out and started cutting. Now I want to be real with you here. These photos are adorable. My kid's focused attention, the fun with knives and cutters. 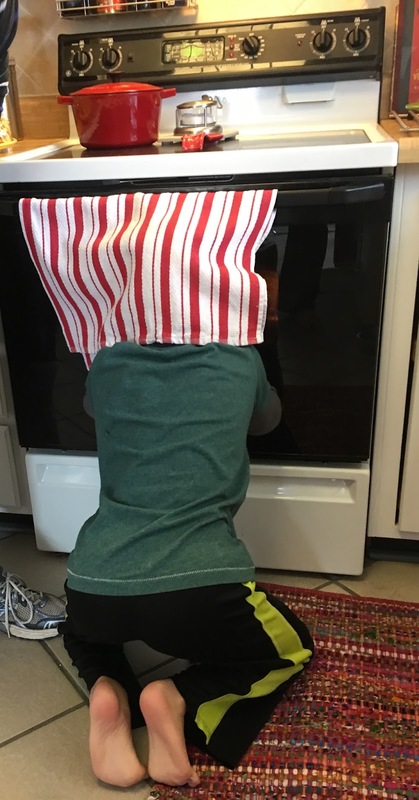 The peeking into the oven to see if the cookies are done. Oh so cute. And I love baking. But. But baking with a ten year old, a stubborn, challenging, deeply independent 10 year old, is hard and messy and sometimes frustrating. It's not bad, but it's not easy. So much wrangling and instructions ignored, and eventually I just leaned in and let him do his own thing. Because they're just cookies, right? So he set himself up with a little jelly bean cutting station, and got to decorating, because the Star Wars cutters were "kind of boring and needed to be more fun." And who doesn't think Darth Vader looks even more menacing with red jelly bean eyes? So I'm teaching the kid some actual baking/cooking skill and he's teaching me to be less of a control freak in the kitchen, ok, in the world at large. Cookies baked, we could get down to the fun part: the decorating! We each took a turn with the icing bags, and we came out with some gorgeous Storm Troopers, some wise green Yodas, a jelly beaned set of Darth Vaders, some abstract stars, and crunchy delicious Boba Fetts too. It really was fun. And no 10 year old can be cynical when Mom lets you pipe green frosting directly into your own mouth at the end! So cookies baked we headed off to my dad and step-mom's house for family dinner complete with uncle and cousins and homemade biscuits, all the necessities of a happy Easter. It was a really nice day. The thing I'm figuring out with having kids at the holidays is that expectations need to be managed. Ours and his. I need to be less controlling about the plan of the day, I need to anticipate that the non-routine weekend filled with less sleep, more sugar, more people, and more stress, will almost certainly guarantee some kind of kid melt down, and that's ok. I need to just be ok with hanging out with my family without some kind of Pinterest fantasy of what the day will hold. Sure, I wanted a lovely family portrait on Easter. We all looked nice and showered and happy, and of course my kid stuck a blueberry ring pop in his mouth moments before photo time. But who cares? This is what he looks like. This captures his personality and ours better than some pleasant holiday portrait. So I'm working on embracing that part and caring less about how straight my Storm Trooper frosting is. So Happy Easter to you! Embrace the crooked Storm Trooper in all of us!